There are at least 10,000 chowkidars in Jharkhand’s 24 districts who have not been paid for the last three to four months, according to Krishna Dayal Singh, president of Jharkhand Rajya Dafadar Chowkidar Panchayat. Chowkidars standing outside Angara circle office in Ranchi. While Prime Minister Narendra Modi addressed “25 lakh security guards” on the eve of Holi to counter Congress president Rahul Gandhi’s “chowkidar chor hai” jibe, 50-year-old Suresh Paswan of Saraidih village in Jharkhand’s Palamu, designated by the state as a chowkidar, swears that becoming one was his “worst decision”. Paswan has not received salary since October 2018 and is in debt. Among the 18 chowkidars under Tarhari Police Station who have not been paid for over five months, he says he is a “soodkhori ka shikar(victim of usury)”. According to Paswan, there are 450 chowkidars in Palamu who remain unpaid. Chowkidar, who serves as the “eyes and ears” of the police in villages, is a sanctioned post under the Village Chaukidari Act of 1870, under the purview of the state’s home department. However, the salaries of all chowkidars in Jharkhand come through the district administration. “Luckily my sons studied, and now run a dairy business,” Paswan said. “This is how we are living, but it is tough,” he says. Last week, around 20 chowkidars silently protested outside the Ratu Police Station in Ranchi. Krishna Dayal Singh, son of a chowkidar, said there are 17,500 sanctioned posts, of which only 10,000 are occupied. “All of them are without salaries for two-five months. Politicians and government officers get their salaries on time, but think about chowkidars. PM Modi identified himself as a chowkidar, but does he really understand our problems?” he said. Krishna said he had sent multiple letters to the Home Department and the Chief Minister demanding pension, conveyance, timely wages, among others, for the chowkidars. 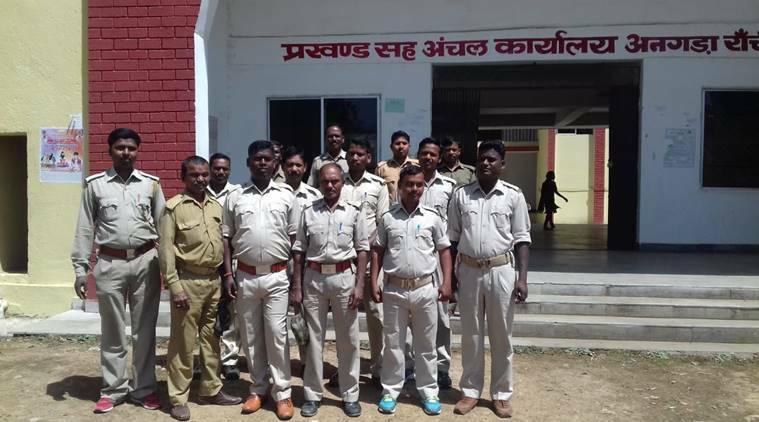 At least 250 km away from Tarhari, under Paterwar Police Station of Bokaro district, there are 22 chowkidars. Among them is Raju Ansari, who has been in the job since the early 1990s. His beat includes gathering intelligence for the villages, tipping off the police about crimes and ensuring peace during festivals. For him, this Holi was, however, colourless. “Since December, I haven’t received my salary. I made many trips to the Circle Officers under my block but did not get any response. I have run up debt to bring up my three children.” He earns Rs 28,000 per month. Paterwar Police Station in-charge Sub-Inspector Bipin Kumar said though payments have not been made for the last four months, chowkidars should not get “dejected” because in some government posts, delayed salary has become a “norm”. But Ansari said people have started asking for their money. Ranchi Deputy Commissioner Rai Mahimapat Ray said salaries of the 240 chowkidars in the district have been paid till March. However, Chowkidar Raj Kishore Mahto of Ranchi’s Angara block said he is yet to receive his salary for January and February. “We don’t get reimbursements for our work-related travel,” he said.